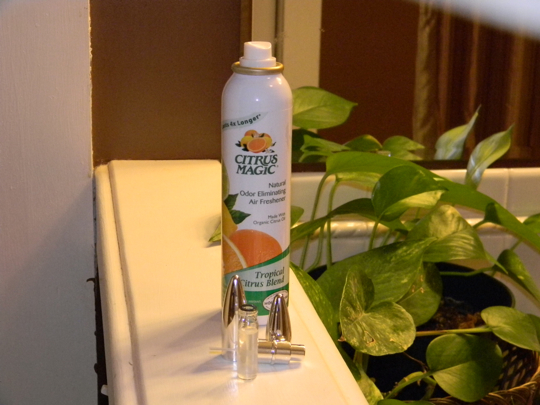 A long time ago I made a post about Citrus Magic, the amazing orange spray that makes your bathroom smell like candy, even after unspeakable things have occurred in there. Well, sometimes unspeakable things occur outside the home, and I thought I could do something about it. 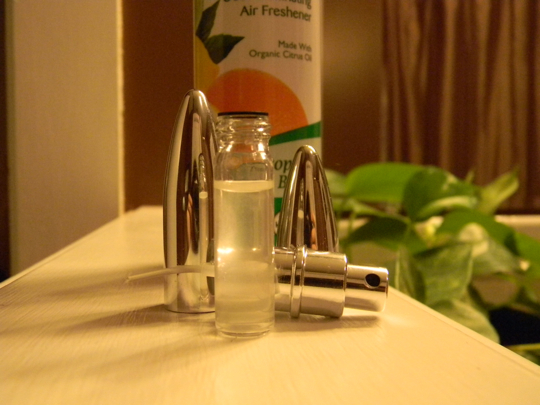 At work, the main deodorizing spray is cinnamon-scented, and while it does a fairly good job, I am beginning to associate the smell of cinnamon with poop. I’d like to try the Citrus Magic, but it’s a little pricey. Instead of taking my whole precious supply to school, I’m going to sneak some in and see if this product can take on six toddlers who are toilet-training. I’ve had this perfume atomizer for years, and have no idea where it came from. I’ve never had a chance to use it, but now this thing finally has a noble purpose. Go, Citrus Magic! That atomizer is really cool! It looks like something a beautiful (but evil) woman would spray in James Bond’s face to knock him out so she could strap him to the machinery in some factory that would slowly pull him toward a giant table saw. I love the smell of citrus; it’s so refreshing. You need to find out where you got this atomizer. I think I want one. I third that that atomizer is awesome! Here’s hoping your Citrus Magic doesn’t start reminding you of poop…HA! From my own experience, I think it conjures up the aromatic image of someone defiling a fruit salad.